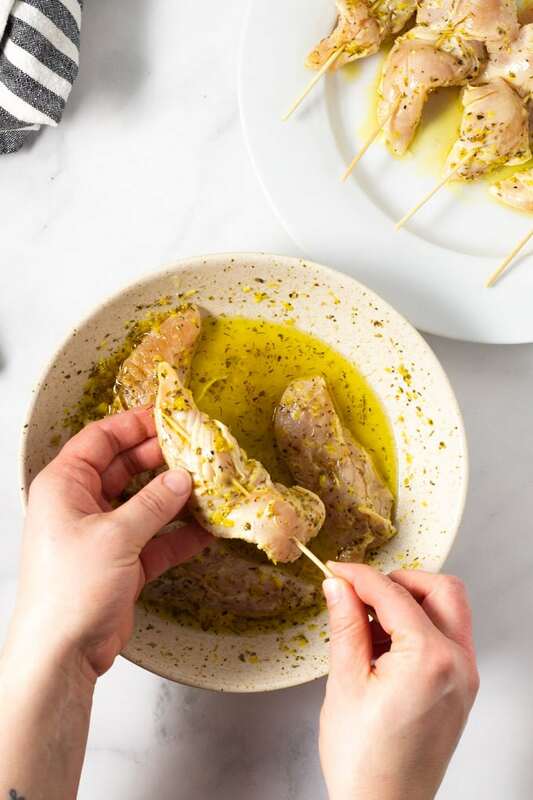 A simple Mediterranean inspired marinade, followed by a quick sear on the grill (or in a saute pan) and you’ve transformed a boring chicken dinner in a drool worthy, delicious dinner! 45 minutes from start to finish (30 minutes of which is marinating!) and your healthy lunches are prepped for the entire week! 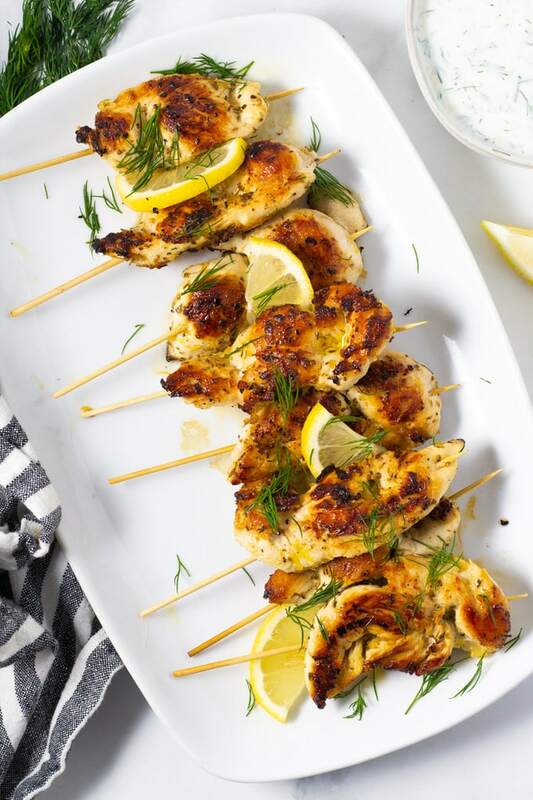 How do I make Mediterranean Chicken Kebabs? You’ll start by combining olive oil, lemon, juice, oregano, garlic powder, salt and pepper. Give the tenders a quick marinade in the fridge. Then you’ll thread the chicken tenders onto 6 inch wooden skewers. You’ll heat oil in a large saute pan and cook the skewers in batches until they are golden brown on the outside and the chicken is cooked through on the inside. 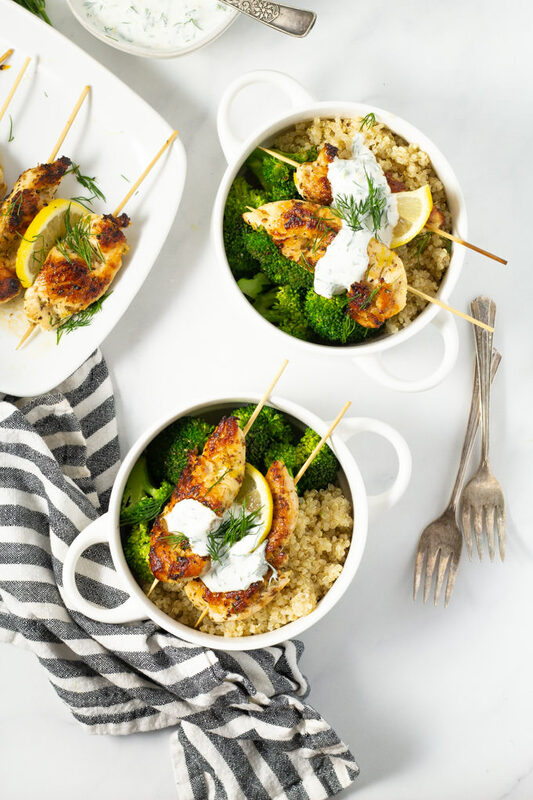 My favorite way to serve Mediterranean Chicken Kebabs is with sauteed broccoli, quinoa and my homemade tzatziki sauce. It’s quick and easy! Some marinades require hours of marinating. This recipe has a super quick marinade that can be thrown together in just a couple minutes. 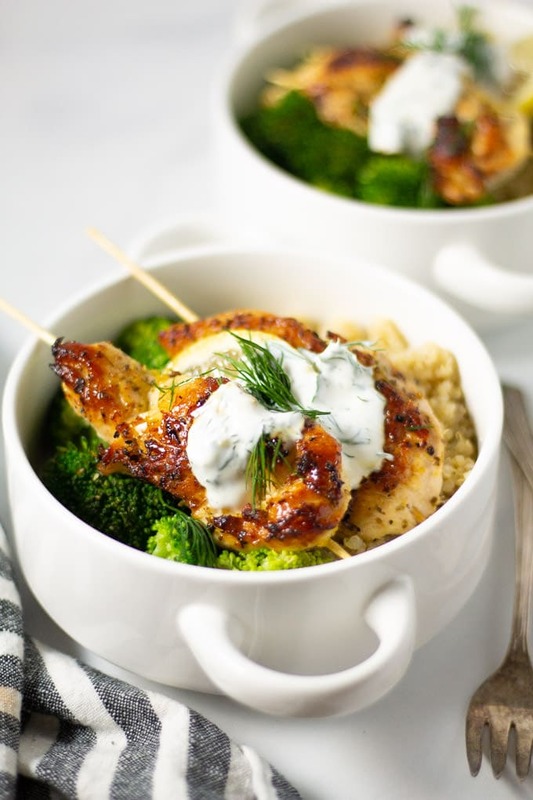 30 minutes is all it takes to get a flavor, Mediterranean inspired chicken breast. It’s not your usual, boring seared chicken breast. This recipe gives your usual chicken, veggie and starch dinner combination a tasty makeover utilizing fresh flavors and dried herbs. There are no special cooking techniques or kitchen gadgets required. You don’t need any special tools or years of experience in the kitchen to throw this recipe together. 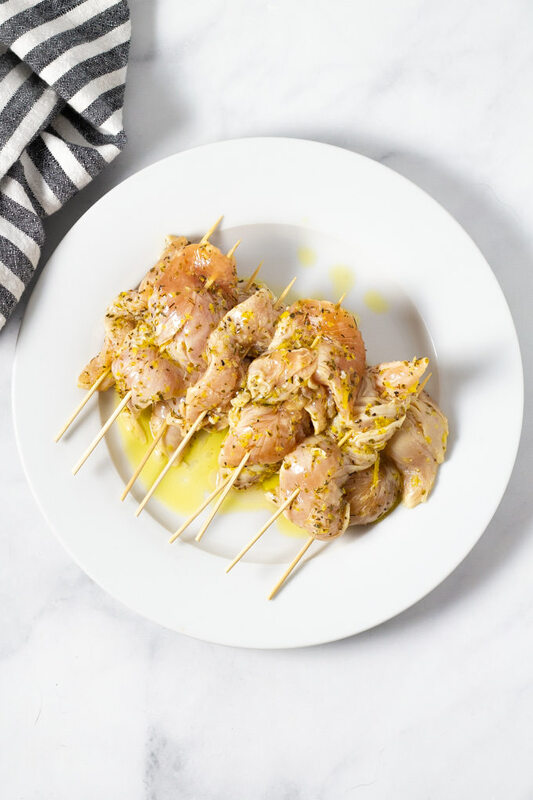 If you can slice a lemon in half and squeeze it, you can make this Greek chicken! Don’t marinate the chicken for longer than 30 minutes. 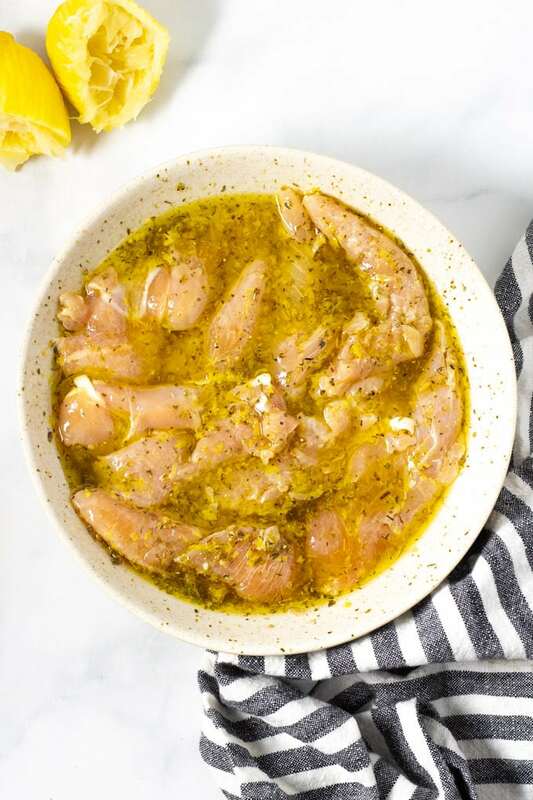 The lemon juice in the marinade will actually begin to cook the chicken if you marinate it for too long which will lead to an undesirable texture. 30 minutes is the sweet spot for the marinade to penetrate the chicken, but not actually start cooking it. Don’t stress if you don’t have 6 inch wooden skewers! You can use shorter ones, longer ones or no skewers at all. 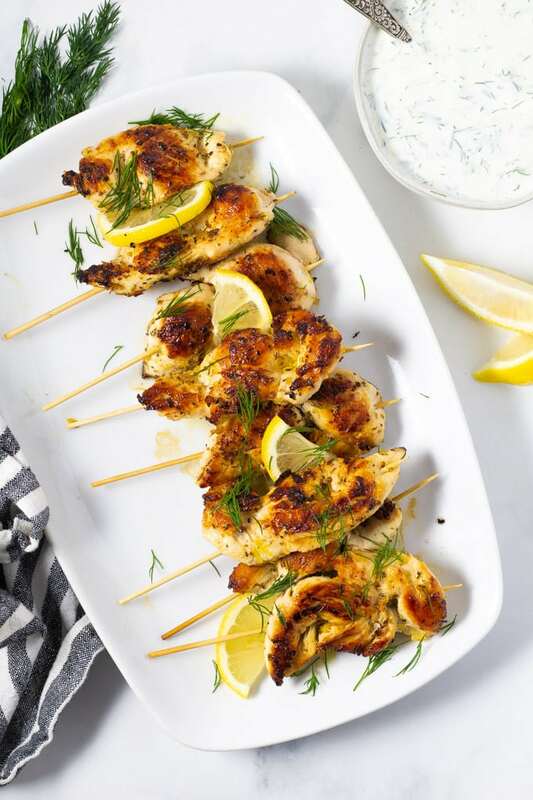 The chicken will still taste great even without the skewer – I just love the skewers for the presentation and ease of eating. Use your oven to hold the warm chicken while you cook the second batch. Heat your oven to 300 degrees and line a baking sheet with tin foil or parchment paper. One you’ve finished cooking your first batch of chicken, transfer it to the baking sheet and pop it in the oven while you finish cooking the second batch. The low oven temp will keep the chicken warm without drying it out. 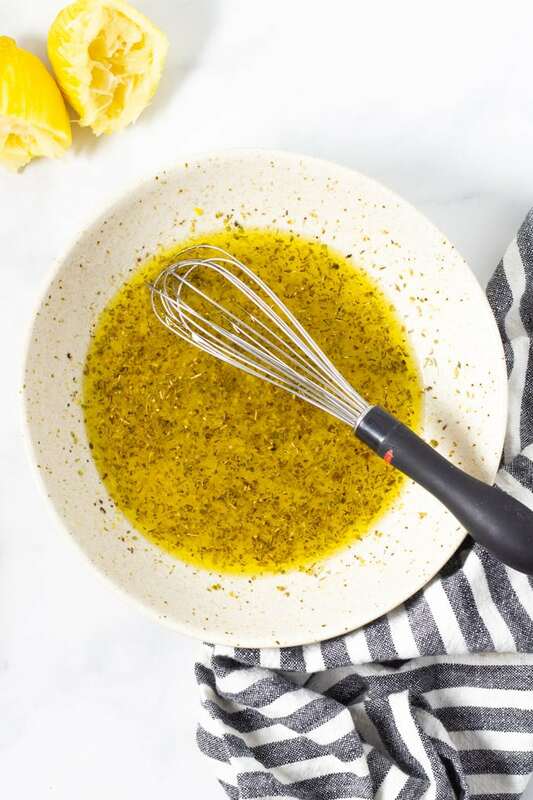 In a medium bowl combine 1/4 cup olive oil, lemon zest and juice, oregano, garlic and a large pinch of salt and pepper. Add chicken tenders to the bowl and nestle them into the marinade so they are almost completely covered. Cover and marinate for 30 minutes. Heat 1-2 tablespoons olive oil in a large saute pan over medium high heat. 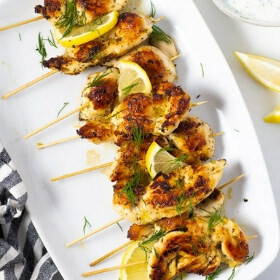 Thread marinated chicken onto the wooden skewers. Saute chicken in 2-3 batches depending on the size of your pan. Saute each side for 3-5 minutes or under a dark golden brown crust has formed and the chicken is cooked through. 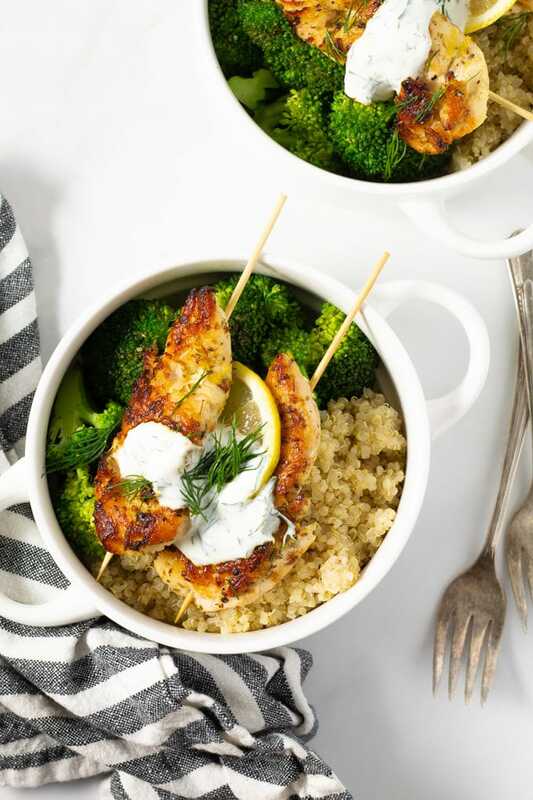 Serve with tzatziki sauce, quinoa, broccoli, fresh dill or parsley and lemon wedges. A quick, easy and healthy meal prep recipe to get your week started off on the right foot! An amazing dish with amazing flavors!! 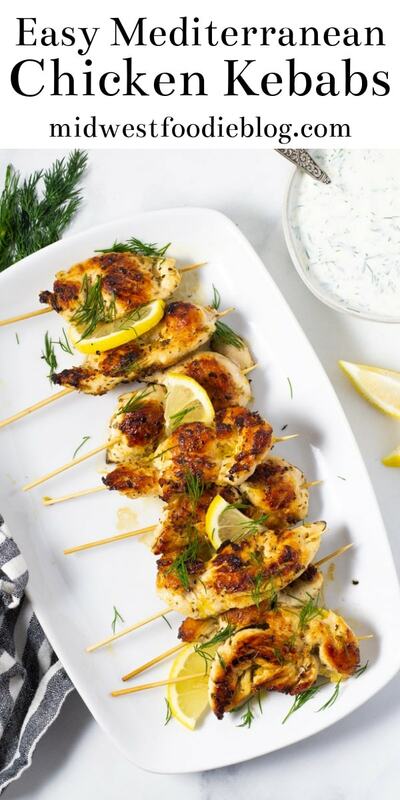 Chicken kebabs (souvlaki) is a traditional dish in Greece. In fact, you could take the ingredients and use any kind of meat you have on hand instead of chicken, such as pork or lamb. I bet this recipe would be delish with pork or lamb. Great idea Nick!